The American gun laws, gun violence and mass shootings are again one of the unfortunate main stories circulating in the western world at the moment. Yet another monstrous school shooting has occurred, this time at Florida High School where students and teachers were gunned down in cold blood. The gunman, Nikolas Cruz, was 19 and used his own assault rifle to shoot more than two dozen students and teachers within six minutes; 17 people died. Cruz also owned other weapons, all of which were purchased legally. 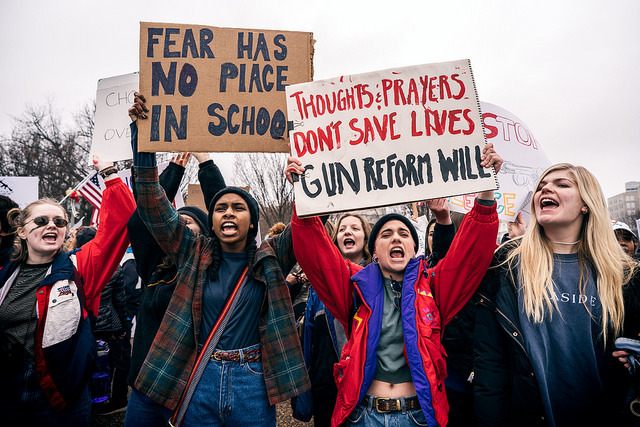 In an extraordinary show of unity and political solidarity, surges of students marched out of class on Wednesday, March 14, to make a point of demanding stricter gun control. This happened from Maine to California. The National School Walkout, that people are also referring to as E.N.O.U.G.H., took place at 10:00am in each time zone. These students protested for at least 17 minutes, one minute for each of the 17 people that fell victim to the mass shooting in Florida last month. The main reason for marching is so that they can be heard by Congress. They demanded that assault weapons should be banned, that there should be a universal background check before all gun sales and a passing of a law in order to allow restraining orders on weapons; this would give courts the ability to disarm people who display warning signs of violent behaviour. These laws could have prevented the mass shooting. Cruz’s behaviour demonstrated major red flags throughout his life. He was suspended from school for fighting other pupils, transferred to a school for troubled youths and he was reported to law enforcement numerous times, three of which were reports that Cruz had shown signs that he could carry out a school shooting from his behaviour and words. How could someone with a past like this, legally be sold multiple rifles, at the age of just 19? Concert-goers in Las Vegas also found themselves under fire in October of last year. They suffered the worst mass shooting in modern history; with one individual using multiple assault rifles and killing 58 people, as-well-as wounding over 400 in the short space of just ten minutes. An assault rifle is a lightweight rifle developed from the sub-machine gun, which may be set to fire automatically or semi-automatically. It is extremely hard to fathom how one individual can kill and wound that number of people in just a few minutes. Assault rifles are both astonishing and effective, however, their main duty should not be to murder innocent people. So, how did mass shootings get to be so frequent in the US? In 2013, the Gun Violence Archive (GVA) was formed to provide free online public access to accurate information about gun-related violence. Data from the GVA reveals there is a mass shooting – defined as four or more people shot in one incident, not including the shooter – on nine out of every ten days in the US. It’s not easy to reverse the US’s gun violence culture, however, like all problems, there are one or more remedies that can dramatically improve the situation. A version of the Australian gun laws, adjusted to American gun culture, is one powerful such remedy. In 1996 in Tasmania, Australia, a 28-year-old man armed with two assault rifles and a knife killed 35 innocent people and injured a further 18. This was the worst mass shooting and killing in Australian history; apart from killing two people initially, hours before at a different location, Bryant had opened fire and killed 33 people in a small café and the rest, in under 30 seconds. He had used a knife to kill the two innocent people at the first location, and had he tried to use this weapon, rather than a gun, on the victims of the café later on, he would have likely only killed up to five more people before getting caught. This goes to show that fire arms can kill many more people within seconds than other weapons. This massacre prompted a huge outcry in Australia, within weeks, laws were passed across all Australian states and territories to ban assault rifles and a buy back scheme was introduced to get as many guns out of Australian households as possible, which was very successful. Those guns were destroyed, and owners compensated generously; the buy-back scheme was paid for by a temporary small increase in taxes. The government also banned the import of assault rifles. Added to this, a law was passed that all gun owners needed a licence to hold a gun (previously only handgun owners needed a licence). The criteria to obtain a gun licence and background check was further strengthened also. Twenty-two years have passed since the mass shooting in Australia, and the results of the swift and powerful new gun laws have had a profoundly positive effect as there have been none since, at least none involving assault rifles. A further example to prove the value of this policy change was seen in 2002 at a Melbourne University in Australia; where a lone gunman armed with six handguns, shot and killed two people and injured a further five. Because of these new gun laws in Australia, he admitted that he wasn’t able to gain access to an assault rifle, however, if he had, it’s almost certain that the death toll would have been dramatically higher. Not only this, but gun ownership as a whole decreased around 20 per cent, and significantly gun homicides and suicides decreased by almost 50 per cent. So, why can’t the United States of America bring in their own, tighter gun laws to prevent these kinds of massacres from happening? Historical data from the US shows that there was a ten-year assault weapon ban from 1994-2004, to target the reduction of mass shooting deaths, which it indeed did. It reduced mass killing by 37 per cent. Eventually, the National Rifle Association (NRA) used their ever-growing power to re-introduced the legalisation of rifles; and in the following ten years since the ban was lifted, gun massacres increased by an appalling 183 per cent. The answer for America almost seems too simple to be true: increase the severity of background checks, introduce tougher gun licensing, and ban all assault type guns. They may just find that fewer civilians are dying for no reason. Featured image by Louie Shaull via Flickr CC.